Upton Boxing Center has become a mecca for local amateur boxing by developing state, regional and national champions in youth and young adult age groups. 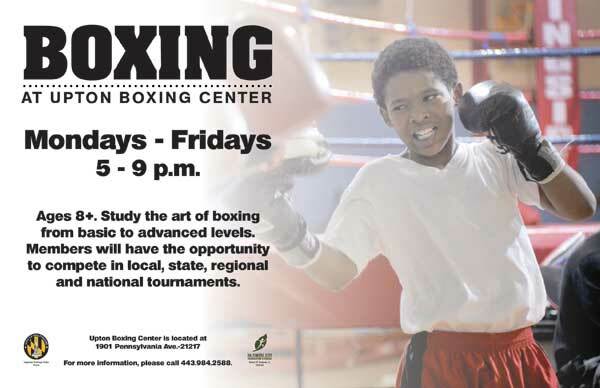 The facility is a great place for top-notch instruction or fitness boxing, featuring a boxing ring, punching bags, heavy bags, full weight and shower rooms. Upton is affiliated with USA Boxing, Junior Olympics, Golden Gloves, Silver Gloves and Police Athletic League (PAL). Upton hosts several amateur boxing events each year. It also hosts outdoor boxing and a jazz event each summer at nearby Legends Park. The center has a computer lab for homework activities for students and free Internet access for all users.